Jeannie Mountain Flower Dunlap is the daughter of Carmelita Dunlap. Mountain Flower was born in 1953 and started potting in 1975. She has exhibited every year at the Santa Fe Indian Market since 1985. 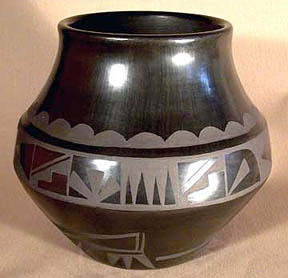 She is known for her classic black on black ollas with painted traditional designs.